Microsoft HoloLens is finally in the hands of developers meaning we'll hopefully see a finished version within the next few years or sooner so we can enjoy AR in our own homes. We're also crossing our fingers for a cheaper price point considering the HoloLens' $3,000 certainly beats Google Glass - and even the Oculus Rift and HTC Vive combined - for most expensive wearable tech. In the meantime, experiences are starting emerge from the land of Microsoft, and more will soon follow thanks to all the smart devs tinkering away. Until they're finished, Microsoft has teased a few apps and games you can look forward to using and playing on the augmented reality headset. 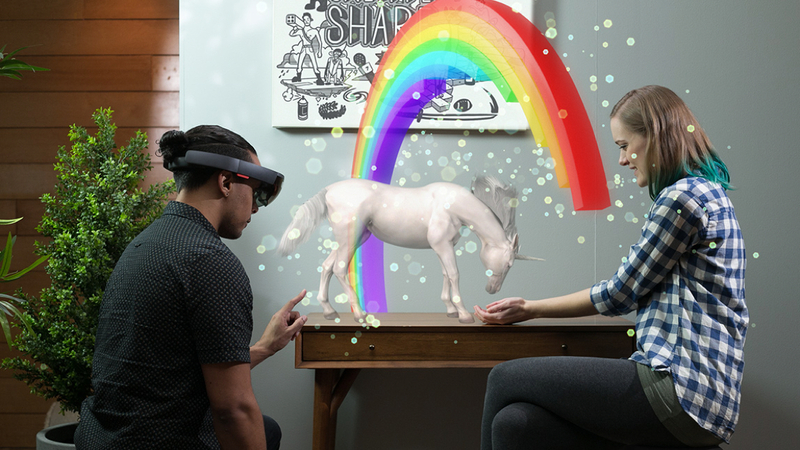 We've also added a few ideas on our end on what we want to see on HoloLens. Minecraft seems to be the Microsoft cash cow and the company's going to keep milking it for all it's worth, including sticking it in AR. Which is completely fine with us. It's a simple enough game that's a huge timesuck, but also incredibly addictive due to its neverending exploration and building modes. With HoloLens, Minecraft will be whole new game. Remember the days of Skype before Slack and all the other chat platforms were born? Well, perhaps you'll be inclined to use it again if AR and HoloLens are involved. It actually sounds pretty promising too. HoloLens will track your hands so you can draw out objects, real-time spatial mapping lets you interact with the environment and the app will be compatible with other devices, meaning the other person doesn't have to use their own HoloLens. Neat. HoloStudio debuted last year and combines gestures, voice allowing users to create 3D objects. HoloStudio also lets users create stop-motion video by moving elements of their 3D creations slightly between frames. This can be done with your hands or a clicker for more precise adjustments. RoboRaid, previously codenamed Project X-Ray made a small appearance at E3 last year. It's essentially a robot battle game that combines wearable holograms into a first-person shooter. You get a mixed reality experience as it uses spatial sound, voice input, gestures and your gaze to fight off the invasion. Fragments makes you a detective in the midst of a crime drama where life size characters can pop out of nowhere, sit down on your couch and have a conversation with you. Spooky. Clues and are also dispersed around the room forcing you to actually investigate to get to the bottom of the mystery. HoloTour is similar to 360-photos that you can experience on VR mobile headsets. It uses a combination of panoramic video, holographic scenery and spatial sound to create virtual travel. Just like Minecraft, you can also stick your face closer to observe your surroundings better. Young Conker transforms your furniture, floors and walls into a mixed reality platforming adventure where each level changes if you move off to a different room, or rearrange your furniture. The little guy will also break the fourth wall and talk to you too. Actiongram is basically the HoloLens version of Snapchat and Vine. You can make little videos, or stories, and add in special effects including animations and audio. All your creations can be shared online with friends. It will be awhile before we see the experiences above from developers, so who knows when, or if, these apps and games will get a chance for augmented reality. But we can still put it out there and wait to see what happens. While it makes more sense for a company like CastAR to make something like the famed game played on the Millennium Falcon, it's not asking too much for Microsoft to make one too. In fact, any board game where you can see the figures fight it out in front of you while hanging out with friends would be incredible. While on the subject of games, what about the likes of Sim City or Starcraft? Virtual reality is already taking advantage of using your hands to control planes in Final Approach - that game could work for AR too. You won't get the same experience of being inside a world with a city sprawled out in front of you, but imagine landing a little plane on your coffee table after you've looped it around your cat's head. Sims and strategy games would allow you to peer into the worlds and command various actions that would be just as perfect for AR. If you're going to include DIY ways to fix broken things around the house, why not throw in cooking apps as well? There are already plenty of smart kitchen appliances you can pick from, but HoloLens could take it to the next level. Checking off steps in recipes, looking at ingredients and showing how much you need to measure out, pointers can be displayed in front of your face if you don't know how to do something and more, all could be right there hands free.